Head coach Tom Izzo of the Michigan State Spartans during a game against the Georgia Bulldogs in the second round of the 2015 NCAA men’s basketball tournament at Time Warner Cable Arena in Charlotte. A No. 7 seed unseats a No. 2 in the NCAA tournament’s second round about twice every three years, but there was something about Michigan State’s upset of Virginia on Sunday that felt more routine than that. Perhaps it was the fact that the Spartans had toppled the Cavaliers just last season, but beyond that, no second-week tournament run from Michigan State qualifies as surprising at this point. As you might have heard, Izzo’s Spartans are now 13-1 all-time in the round of 32, and they’ve visited the Final Four more often (six times) than they’ve lost in the tournament’s opening weekend (five times). Digging deeper into the numbers only solidifies Izzo’s reputation as Mr. March. 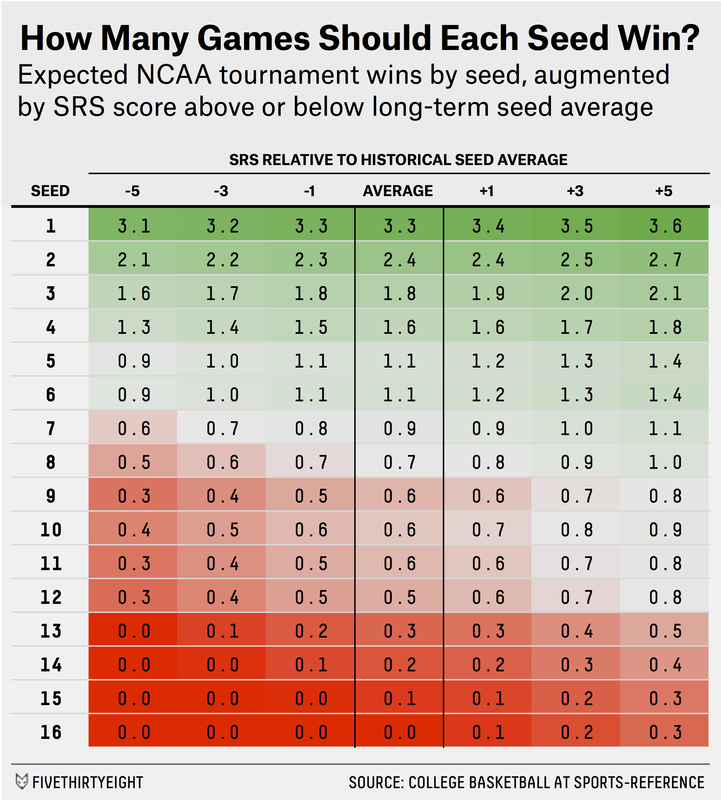 A few years ago, FiveThirtyEight editor-in-chief Nate Silver wrote about how unlikely Izzo’s teams were to have consistently advanced as far as they did from the seeds at which they started — and that was at the very beginning of the five-season stretch (from 2010-present) where the Spartans advanced to four regional semifinals and one regional final. By any standard, Izzo’s teams tend to wildly exceed their expectations once the NCAA tournament commences. 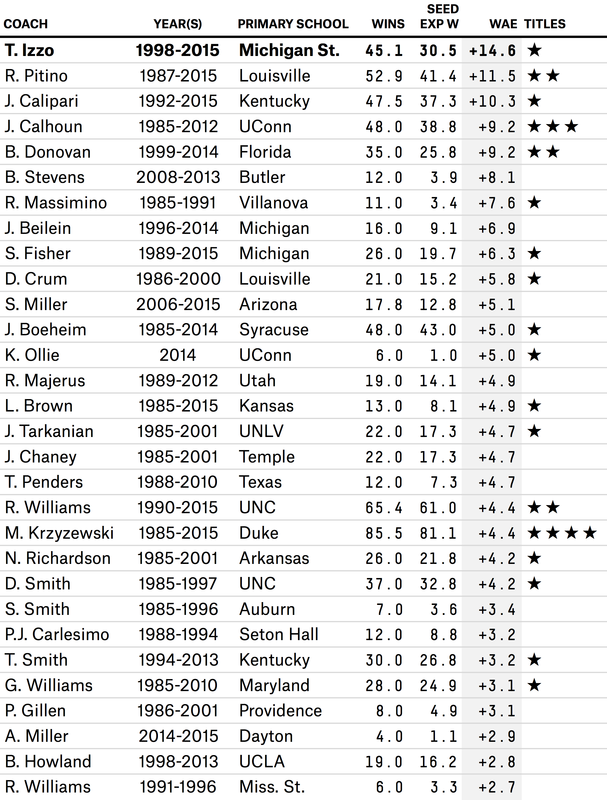 We can track where Izzo ranks among all tournament coaches in the 64-team bracket era1 by comparing his actual wins to the number we’d expect of a team with the same seedings and pre-tournament Simple Rating System (SRS) ratings. And — spoiler alert — he’s No. 1 by a wide margin. Izzo’s performance is almost seven standard deviations above average, lending further credence to Nate’s assertion that Izzo isn’t simply the outlier you’d expect to naturally arise in a data set of 523 coaches. Rather, there seems to be something very real — whether it’s coaching, or perhaps recruiting the types of players whose styles suit March Madness — about Izzo’s ability to take his Michigan State teams much further in the tournament than the numbers or seedings say they ought to go. Disclosure: East Lansing native Nate Silver was not involved in the writing or editing of this article in any way. In the table, “Year(s)” denotes the range of years between the coach’s first and last NCAA tournament appearances in the 64-team era, which started in 1985.